Investing in US shares is now simple and affordable for Australian investors. See below for regulatory and other fees that may apply. $0 brokerage on all trades. We've used technology and forged strong partnerships to keep our costs down and deliver you something better and cheaper. We make our money on the FX transfers, not when you trade - It's as simple as that! We charge $0.70USD for every $100AUD (min $2USD). Only when you transfer funds between AUD and USD, not on each trade! Other brokers make you transfer funds every time you buy or sell shares. Give that the flick! A US tax fee ($5USD) is charged on your first funding. There are the small fees (USD) passed through to the relevant regulatory authority on share sales. Minimum transfer between AUD to USD is $50AUD. Free or US$15 per position depending on the existing system your broker uses to transfer shares. US$20 flat fee for USD transfers into your Stake USD wallet. Got USD or US Shares? Gifting fee: $5.99USD per gift. Card fee: 2% (min $1USD) when paying of funding your account by card. Or start shopping for shares here. See how we compare with the big boys. Learn more about this comparison here. Based on 20 trades of the same size ($8,000 USD) with the 1 AUD = 0.8USD. There's no catch when it comes to $0 brokerage. We just ask you to share Stake with friends to help us grow. Trading costs in the US are already super cheap and we've kept our costs low so we can pass those onto you. Read how we make it work. What's the catch with $0? 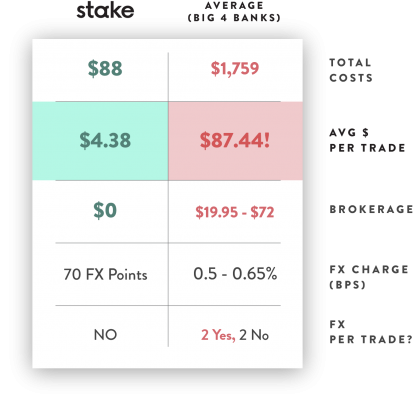 Stake makes money when you move your funds between AUD and USD. Not when you trade. We also make money by collecting interest on cash sitting in the USD accounts, much like a bank does on cash deposits. In time, we'll develop pay-for services and products that add additional value to your trading experience. How does Stake make money? You can sign up and fund your account in 5 mins and be trading in the US market that same day. If you fund your account before 4pm AEST and elect Express Funding your funds will be in the US before the market opens. Currently this is available if you fund by card, but will soon be available for all payment methods. What happens if Stake is no longer around? Fast sign-up. No monthly fees.